I’m to blame for this one- wanted to avoid an American bias for July 4 so why not make the eighth the focus? 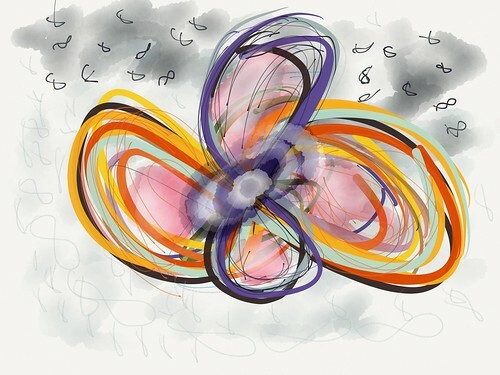 This was a free form doodle on the iPad with the Paper 53 app one I have enjoyed tinkering with to get over my mantra of I Cannot Draw. There’s some mixture of the mild rain and grey clouds that I did as a background with the brush plus it has mixed with the brightness of my flowers represented in the colors of the 8 shapes. I was hoping to play with the idea of the 8 being rotated to become a symbol of infinity. 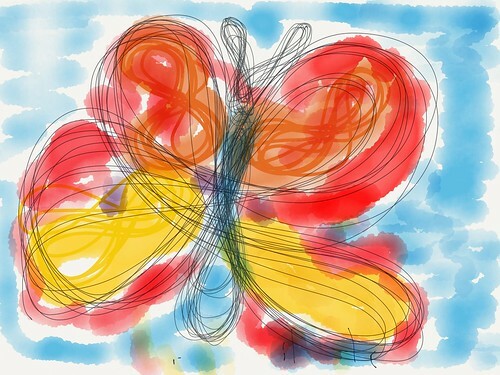 I heart butterflies, Paper 53, all things infinity 8, and the Summer Creativity Challenge!